Islamabad, Jan 17 (www.pakdestiny.com) President Zardari is seriously considering firing Interior Minister Rehman Malik for ‘mishandling’ Dr Tahir ul Qadri’s long march. First Malik allowed Qadri enter the federal capital then planned to disperse the participants of the long march with force. Zardari not only minded Malik’s poor handling of the long march then earned widespread criticism for speaking his mind about launching a ‘target action’ aginst Qadri and his devotees. Qadri also called him ‘Shatan Malik’ and refused to talk to him. 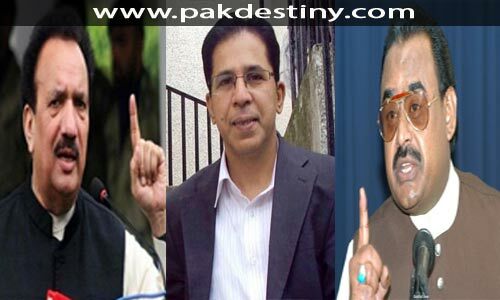 Sources in the PPP told Pak Destiny some senior leaders of the PPP advised Zardari to get rid of him (Malik). Lets see whether Zardari heeds the suggestion of his friends to show ‘Shatan Malik’ the door.